Hi long lost blog readers! Goodness these last couple months have been a whirlwind! It's been a bit of a roller coaster of ups and downs, and this little blog of mine definitely got put on the back burner. But I am back and will be blogging a lot more regularly now! I have a few exciting things to share with you all, the most exciting being....drumroll....I'M ENGAGED!!!! It feels pretty crazy to think that after photographing all sorts of weddings I get to plan my very own special day:) I will share the whole proposal story on here soon, but today's post is about some other exciting news, so you'll just have to check back later to hear about that! Today I am blogging to tell you that I have a new website! 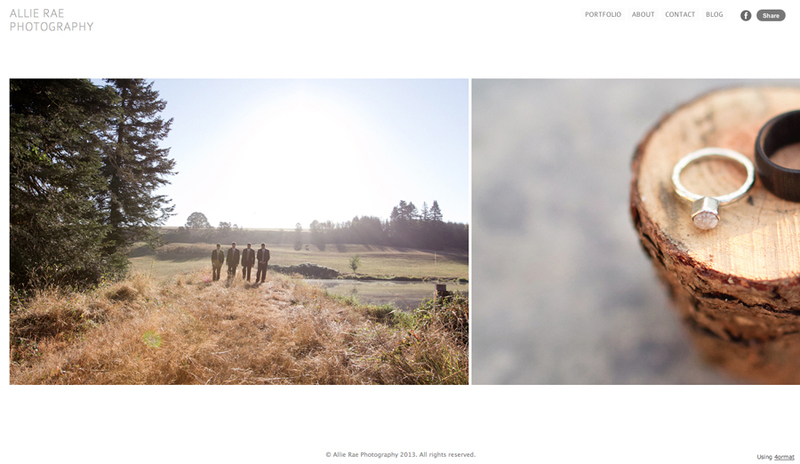 I have been wanting to make a clean portfolio for a while now, but was having a hard time finding something that was simple and all about the photos. But here it is! www.allieraephoto.com my first official website! Go take a look and tell me what you think! I will be making little changes over the next couple of weeks but just wanted to get it out there. So there it is! Also instead of typing in www.allieraephotography.blogspot.com ( a bit of a mouthful!) this blog of mine can now be found at www.allieraeblog.com. So excited for you and to read your engagement story!